Apple this week bolstered its claim that the iPad Pro can perform as a personal computer by announcing significant changes to iOS 11, the mobile operating system upgrade slated to ship this fall, analysts said today. "They don't need to convince anybody, not when you look at what iOS 11 will be delivering," said Carolina Milanesi of Creative Strategies, when asked why Apple did not restate its "iPad is a computer" message from the stage of the Worldwide Developers Conference (WWDC) Monday. Milanesi ticked off examples of the upcoming iOS 11 features she sees as helpful in improving the iPad Pro's position as a computer: "[The] Files [app], drag-and-drop, multiple windows...and there's a lot more there from a usability standpoint that makes you believe you can do this." On Monday, Apple executives used the opening keynote of WWDC to run through the highlights of iOS 11 -- now in the hands of developers -- and introduce a 10.5-in. iPad Pro replacement for the smaller 9.7-in. model. The 10.5-in. iPad Pro features nearly 20% more screen real estate, Apple boasted, enough room for a full-sized on-screen keyboard. But company officials refrained from repeating CEO Tim Cook's assertion of a year ago that the iPad Pro makes "the ultimate replacement device for customers switching from PC notebooks," or a 2016 TV ad's tagline of, "Imagine what your computer could do ... if your computer was an iPad Pro." To Milanesi, doing so would have been redundant because the remaining barriers blocking acceptance of Apple's argument are psychological, not rooted in what a detachable -- and in this case the detachable that is the iPad Pro -- can do. She labeled the iPad Pro -- of both sizes -- when equipped with iOS 11 as a "very powerful device" that "can replace a PC" as soon as the user realizes resistance to the idea was "all mental." "People need to let go of what a PC looks like," she urged. Some are. According to researcher IDC, detachable tablets -- devices like the iPad Pro and Microsoft's Surface Pro, which offer keyboards that separate from the screen -- have been the fastest-growing segment of the global personal computing device market, and will continue to dominate on growth rate. While detachables accounted for just 5% of all devices in 2016, last month IDC forecast that the category will represent 26% by 2021. But other analysts' reading between the lines differ from Milanesi's. "Apple has to be careful," said Jan Dawson, principal analyst with Jackdaw Research, as he noted that along with the iPad Pro and iOS 11, the Cupertino, Calif. company trumpeted new iMac desktop computers and the upcoming macOS High Sierra. "You'll never see [Apple] use the argument that [the iPad Pro is] the end all and the be all. Instead, they'll keep improving each device [Mac and iPad]." Frank Gillett of Forrester Research agreed. Managing the narratives of competing devices remains "tricky," he said, within one event where several are touted. If Apple pushed the idea of iPad Pro as PC replacement too aggressively, it would implicitly disparage the Mac. Like Milanesi, Dawson and Gillett cited several iOS 11 feature additions and enhancements that they said will improve the iPad Pro's efficacy as a computer. During the keynote, Apple's Craig Federighi, who leads software engineering, demonstrated the upgrade -- likely out in September -- with attention to Files -- a new first-party app that will act like a pseudo-Finder (Mac) or File Explorer (Windows) -- a bottom-of-the-screen Dock that closely resembles that on the Mac, and drag-and-drop, one of the cornerstones in a computer-style windowing UI (user interface). "This is the largest iOS release for iPad we've ever done," said Federighi on Monday. Forrester's Gillett applauded Files for putting all files in one view -- including files stored on services like iCloud, Box, Dropbox, and OneDrive -- letting users organize and separate work-related and personal files. "Something like iCloud doesn't really work when you engage with other parts of your life, like your job," Gillett said of mixing personal and work files. "So, this makes a lot of sense." Dawson was especially impressed with iOS 11 and its potential on an iPad Pro. "iOS 11 checked so many boxes of what people had asked for," he said in an interview. "There's a lot there [in iOS 11] that tore down barriers" to working on an iPad Pro. "For the first time, the iPad version of iOS feels like it's gaining a truly distinct identity that's really optimized for heavy-duty productivity tasks," Dawson continued, echoing a call he'd made on the Tech.pinions website in a December analysis that made the case for what he called "padOS," a spin-off of iOS. "iOS 11 is an illustration that they could separate the two [iPhone and iPad], and optimize for the iPad," Dawson added. "It's close to my idea of padOS." 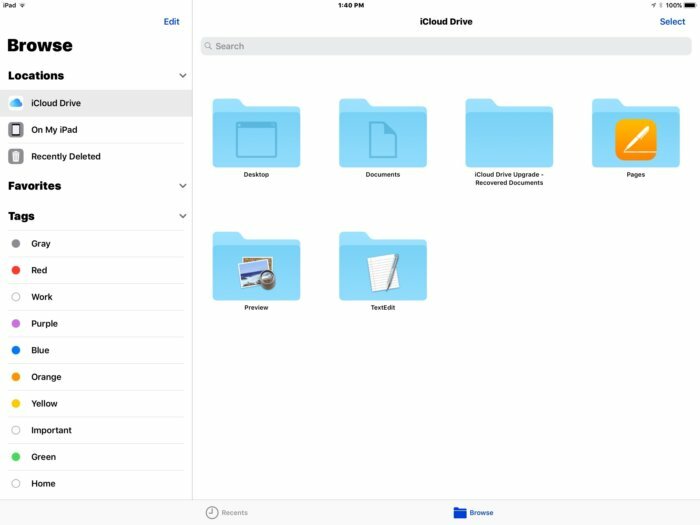 iOS 11's new Files app offers a more traditional file finder/viewer for iPad users who need one to manage workflow.